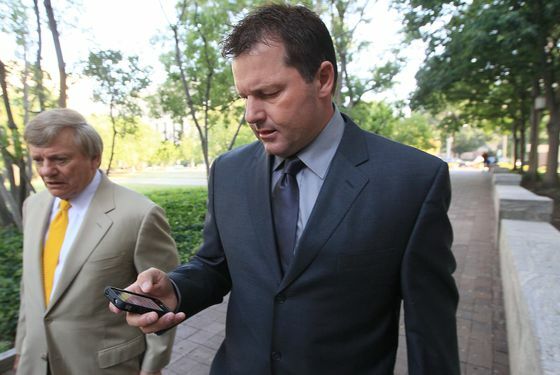 On just the second day of testimony, U.S. District Judge Reggie Walton has declared a mistrial in the Roger Clemens case because inadmissible evidence was shown to jurors. Walton stopped the trial as the prosecution played a video from the 2008 congressional hearings on performance-enhancing drug use in baseball. In the video, Maryland congressman Elijah E. Cummings read an affidavit from Andy Pettitte's wife, Laura, in which she said that her husband had told her about a conversation he had with Clemens about Clemens's use of human growth hormone. But Walton had ruled last week that Laura Pettitte's testimony was inadmissible, unless, according to the Times, it was needed for rebuttal evidence when Andy Pettitte testified. It didn't help matters that when the judge ordered the video to be stopped so that lawyers from both sides could approach the bench, the video remained paused in front of the jurors, with a transcript of what was being said at the bottom. "Let me read to you what his wife said in her affidavit. I, Laura Pettitte, do depose and state, in 1999 or 2000, Andy told me he had a conversation with Roger Clemens in which Roger admitted to him using human growth hormones." Said Walton: "I think that a first-year law student would know that you can't bolster the credibility of one witness with clearly inadmissible evidence." Prosecutors suggested that the problem could be fixed by telling the jury to disregard the evidence they'd just seen, but Walton wasn't having it, explaining that he couldn't know the impact the evidence would have had "when we've got a man's liberty at interest." Added Walton: "I don't see how I could unring the bell." So what happens next? Walton will hear a motion on whether a new trial would be considered double jeopardy. Clemens's lawyer, Rusty Hardin, said he'll need until July 29 to file that motion, and then the prosecution has until August 2 to respond. (The Times reports that when a mistrial is declared, double jeopardy is normally not an issue, according to some legal experts.) The hearing itself would take place September 2. Meanwhile, via the Daily News live blog, a gag order remains in place.